Avon have done it again to offer a product for you to include in your skincare routine. 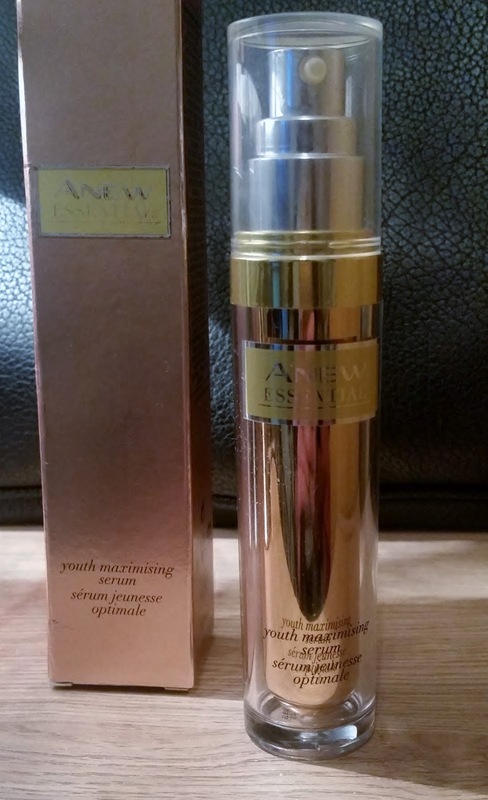 Anew Essential Youth Maximising Serum is a "super serum" that offers to double the power of your desired face cream. The light weight serum supercharges your skin to detect cellular damage and help repair cell damage where and when its needed. What is great about this product is that its so easy to use with any other product that u might be using right now. All you have to do is apply to a cleansed face morning and night and then follow with your desired moisturiser after. I have used this serum with all different moisturisers to see if there would be any counter action between the two products and there wasn't, this actually helped the moisturiser glide over skin more easily and the skin absorb the moisturiser better. There isn't any greasy or tacky feeling and its almost non existent, whilst leaving your skin so soft and flawless with a natural healthy glow. 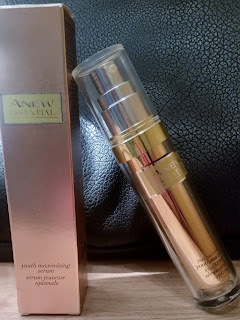 The bottle pump the serum arrives in, gives this product a luxury feel and look with gold and copper packaging, setting itself apart from any other serum on the market. So if your looking for a serum, but you don't want to change your skincare products, then this is a great addition to add, to boost the products and your skin to look its best!